When I visit Dearborn I feel like I stepped back in time to my childhood days growing up in Amman, Jordan. Located in Wayne County, Michigan, this city is home to the largest Arab American population in the United States. The streets are lined with hundreds of Arab-owned businesses and restaurants serving authentic Middle Eastern food. It’s also home to the only Arab American museum in the nation, devoted to Arab culture and history. What to order: Cheese or zatar pies. Shatila: Don’t let the long lines scare you away during busy hours, the line moves quickly. What to order: chocolate mousse cake, petite fours (French pastries), pistachio ice cream , ashta ice cream which is flavored with rose water. What to order: traditional Nablus knafeh dessert. What to order: shawrema sandwich, which is a lamb, beef or chicken in a toasted pita sandwich. Al -Ajami: If you’ve never had a Middle Eastern breakfast, you’re in for the best treat of your life. 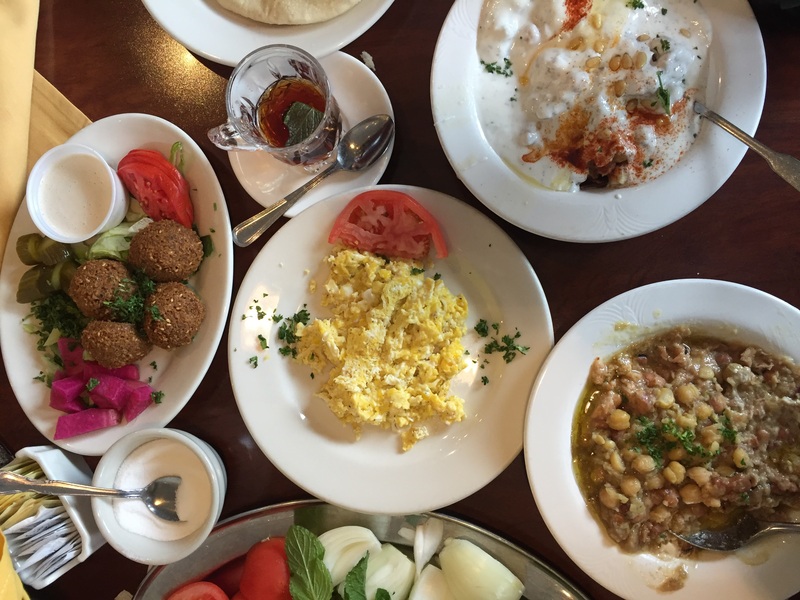 It’s very rare to find a restaurant serving authentic Middle Eastern breakfast in the United States. What to order: A kettle of traditional tea, and one of everything as Arabic breakfasts consist of a large spread of small plates to share. Favorite dishes include eggs , fool (bean dish), hummus, homemade pies. What to buy: see this post here for a complete list of what to buy at a Middle Eastern market. What to buy: Fresh fruit including figs and mangos, dried fruit, and more.